THURSDAY, JULY 26th, 2018 4:30 – 7:30 p.m.
Join Elisha for Sun Kissed! Sunset Spa on the Beach. We are partnering with our friends at Beach Now who are known for curating a perfect beach experience for an evening of organic beauty talk, mini facial massage treatments and summer skin care advice as well as Elisha’s homemade farm fresh nibbles and sips too. It will be too hot on the beach for the creams to come out and play but you can pick up the newest Elique Essentials like Spirit and Conquer as well as many of your other beloved products all at 10% off. 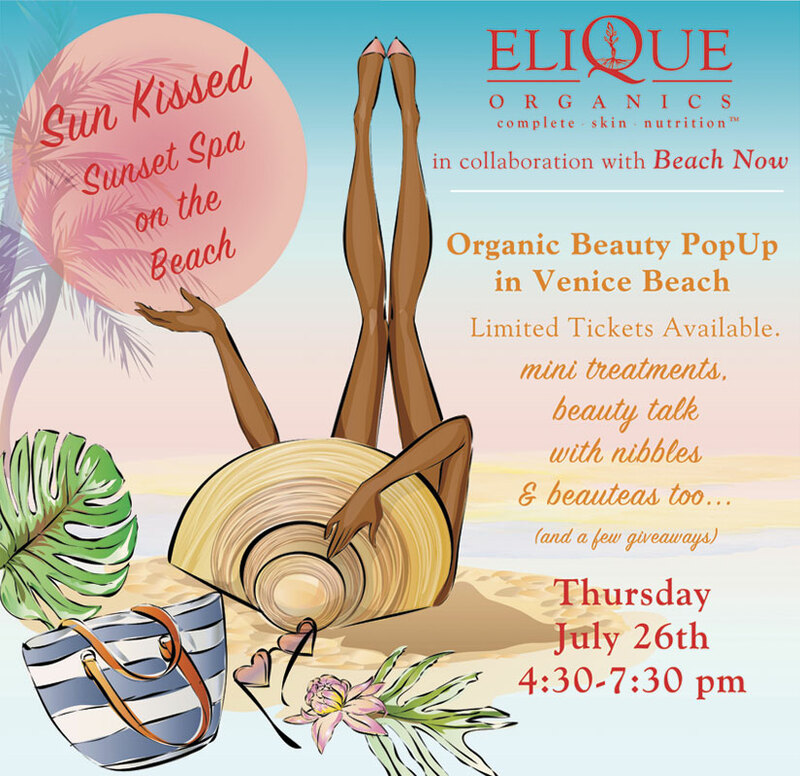 Meet us under our tent at Brooks Avenue in Venice Beach 90291 – Ticket holders will receive a complimentary Elique Essentials Sampler Kit! See you on the sand. Oh wait, did we mention the raffle valued at over $150! AMAZING! Previous Previous post: On Becoming the Crème de la Crème.